The nature of intermittent pen-related posts appearing on this blog would lead you to believe my pen-life is mostly fountain and little else. Inherently there would be nothing wrong with that, however in reality it’s not all nibs and pistons. There is quite some variety in the writing instruments I use on a day-to-day basis, and on that score I’m sure I’m not alone. A big part of that variety is the rollerball, or if you prefer — liquid ink pen (for consistency and convenience we’ll go with the term rollerball from here on in). 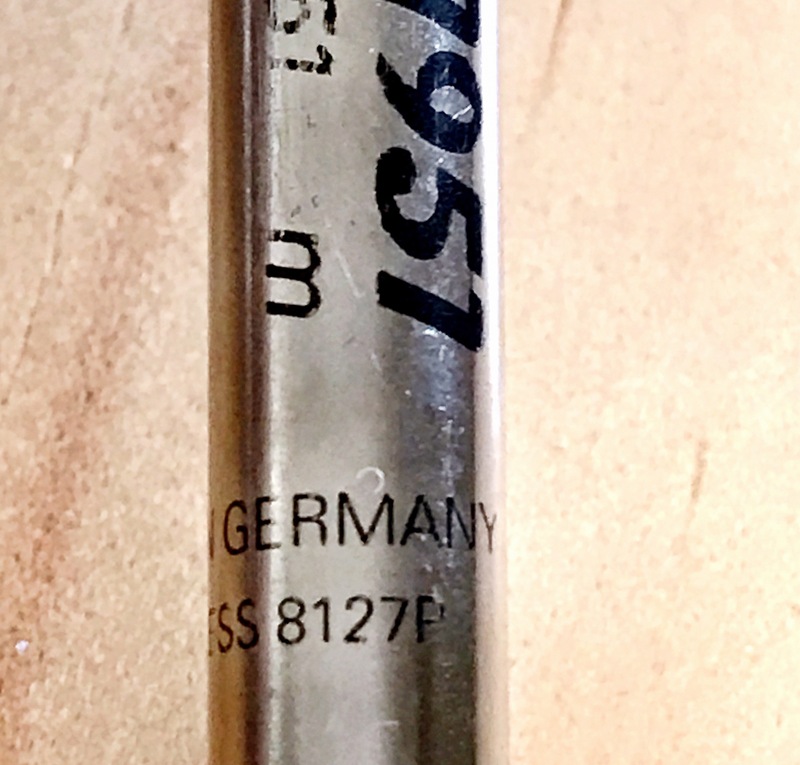 Although the specifics of my rollerball history are varied in themselves (more on this below), in recent times my usage has largely revolved around the “capless” rollerball refills of both the Retro 51 (at times stamped with the P8127 designation), and Schmidt P8126 variety. Like many before me, and no doubt many after — my initiation into said refills came through The Pen Addict podcast, although the exact episode number is not known to me. I’m sure there is an enthusiast or two out there able to pinpoint the actual number, however given Retro 51 pens are mentioned at least every few episodes, specifics are probably not relevant. With a little trepidation (the hype surely couldn’t be matched by reality) I ordered a Retro 51 Tornado pen (the all black Stealth model), and upon receipt was pleasantly surprised. This was a fine-looking and equally stellar-performing pen, and that refill? Yes – it’s a beauty, and has been a regular purchase of mine ever since. Although you may find interchanging use of the Retro 51/P8127 and Schmidt P8126 designations when searching online, they definitely are different beasts when talking line widths. If I had to pick my favourite? 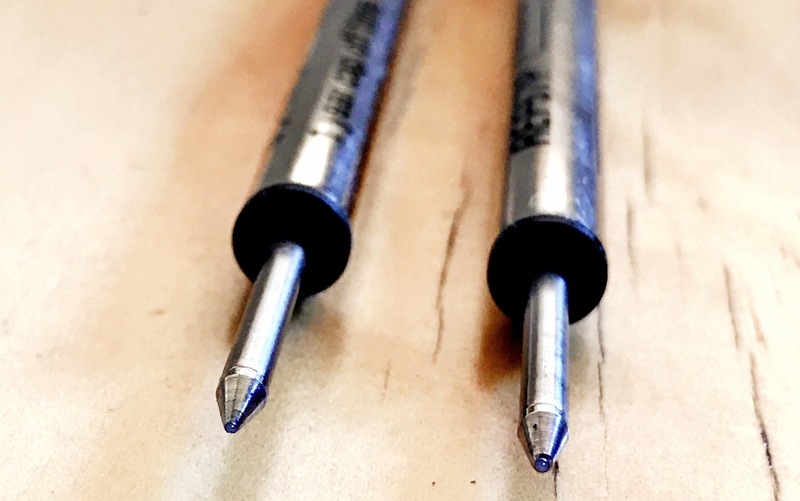 Probably the ever so slightly thinner line of the 0.6mm P8126, however to be honest I’m happy with either, and my local pen store (Brisbane’s Pen and Paper) which I often visit when refills are required, stock the Retro 51 branded P8127 (0.7mm) version. 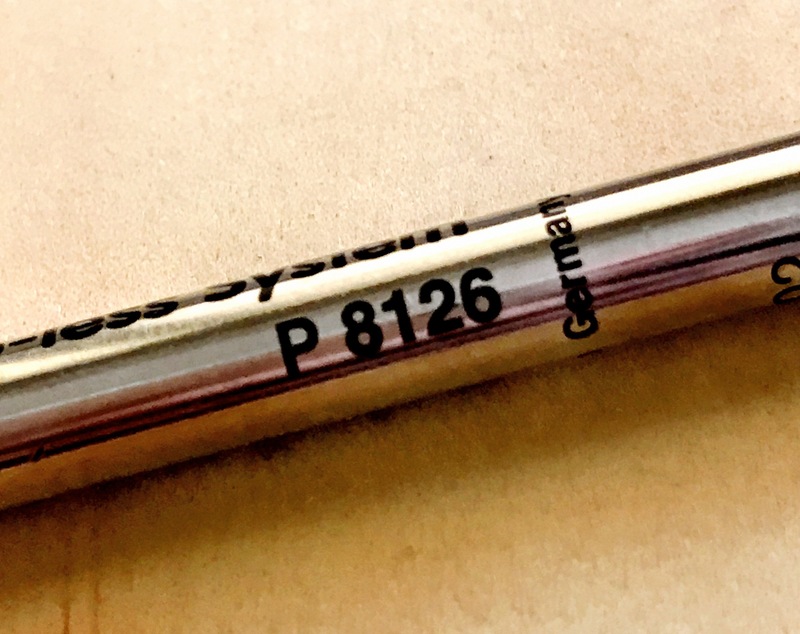 the P8126 refill is 3.9″ (10 cm) long. It is not the same as the Schmidt 8126 refill, which is 4.3″ (11 cm) long. Probably worth noting that last point as far as ordering the correct refill size when the time comes. Speaking of which, when it comes to refills and options for them, you could do no better than to consult an epic guide on such matters, aptly titled The Epic Refill Reference Guide: Rollerball, Gel and Ballpoints by Ana Reinert of The Well-Appointed Desk. Anyway, the rollerball refills in question are known to many within the pen enthusiast world, and are accommodated by an array of pen housings, with Kickstarter often fertile ground for additions to the list. There are quite a few pen options to choose from really, a couple of which I have previously written about (links below), and the others in the list I’ll no doubt look at in future posts as well. Again, certainly not an exhaustive list, however the pens I commonly rotate these refills through, provide a good example of the variety at your disposal in terms of overall design, weight and feel in the hand. The writing experience however is of course consistent and familiar. As with many in this hobby, the memories of where specific points of interest or phases began are quite vivid. I distinctly remember dabbling in a few different types of pens through high school, and in my university years beyond that (student budget permitting). There were no fountain pens to be seen at that time, with the first to come almost a decade later, however you would definitely have found a rollerball or two on my desk. Although it’s a bit of a stretch to remember exactly what they all were, I do recall sampling a good few of your disposable varieties, like the Uni-Ball Eye Rollerball, and I believe some Pentel variants of whatever specific moniker they carried at the time. In attempting to become a little classier (I guess), the Parker Vector made an appearance, along with a Diplomat (the model escapes me), creating my most distinctive memory of them all — it ran out so quickly I was driven back to ballpoints for a while. 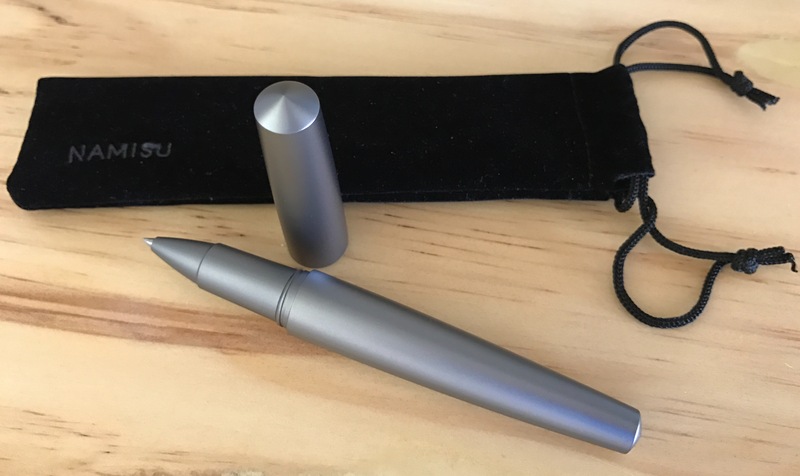 Clearly unfazed, over the next two decades (yes, its been that long) I dabbled here and there, however in recent years with a renewed vigour and enthusiasm for writing instruments in general, the rollerball has made a somewhat triumphant return. There are probably two main reasons I attribute my fondness for rollerballs: my writing style primarily; and the saturation and vibrancy of the liquid ink a rollerball produces. My writing style does not lend itself well to ballpoints or gel inks below about 0.5mm in tip size. At times depending on what I’m specifically doing, even 0.5mm is a stretch. Of course your average ballpoint or gel ink pen will typically write drier than say an EF fountain pen nib. The angle and stroke of my natural writing provides a very scratchy experience with finer non-fountain pens (and certain very fine fountain pen nibs as well), however a rollerball in the usual 0.7mm or 0.6mm is just about perfect. As for the saturation and vibrancy of the ink, this speaks for itself really. A good rollerball will often provide output (once on the page at least) not dissimilar to what you might see with a fountain pen. The blues are deep, saturated and hold their colour over time, the reds and blacks are generally the same. Of course it goes without saying that your colour choices are generally somewhat limited, unless you look further afield to something like the J. Herbin rollerball pen, which I’ve not personally tried, and accepts standard international ink cartridges. Personally, for the uses mine see, I’ve no real need for a vast selection of ink colours, and the basics do just fine. Here the immediate thought of: “well for lots of things where fountain pens dare not tread” is probably not 100% accurate. As you probably know, rollerballs — while perhaps more versatile in some ways than fountain pens — still do not have the ubiquitous acceptance a ballpoint might. On very glossy paper or card stock, they can be just as bad if not worse than a fountain pen. In addition, poor quality standard paper will see feathering typically less than fountain pens, however the ghosting and/or bleed through can actually be worse. If you are anything like me, and unintentionally take a rollerball as a ticket to writing with a firmer hand — this effect can be exaggerated significantly. That said, there is a pretty decent range of paper types that will provide a fantastic writing experience with one of these capless rollerball refills. Personally, I’ve found some of the best to be on slightly toothier paper, such as Baron Fig’s Confidant, or your typical Field Notes for example. Even the standard copy paper we use at the office is a pretty good match, upon which I print out an Emergent Task Planner for the day’s tasks and scheduled activities, and a Cornell notes formatted printout for general note taking. 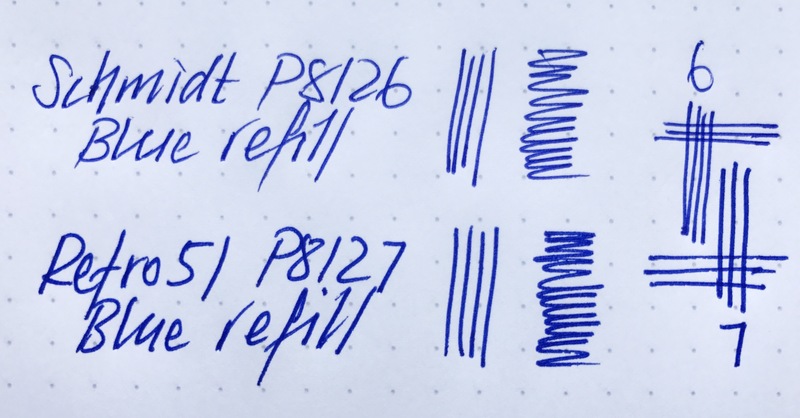 Although I find the writing performance of these capless refills quite an enjoyable experience, longer form writing is not something I choose to use them for. For various reasons, the pens are either a little thin, fairly heavy, or a combination of both. I say that not in a negative way, simply to point out I’d probably choose one of my fountain pen options were I to sit and churn out a few thousand hand-written words. That being the case — where do they excel? As short form note takers. That is, for meeting notes, recording phone calls, daily planning and brainstorming, or outlining blog posts. They are hardy enough to withstand a drop, or lend to others without the need for undue concern. Perfect office pens really, which as I’ve mentioned, is mostly where you’ll find mine. I’ve also been known to have them rolling around on the shed workbench while recording coffee roasting data — a task for which they are more than hardy enough. The benefit of having so many choices available for these great refills is just that — the choices. 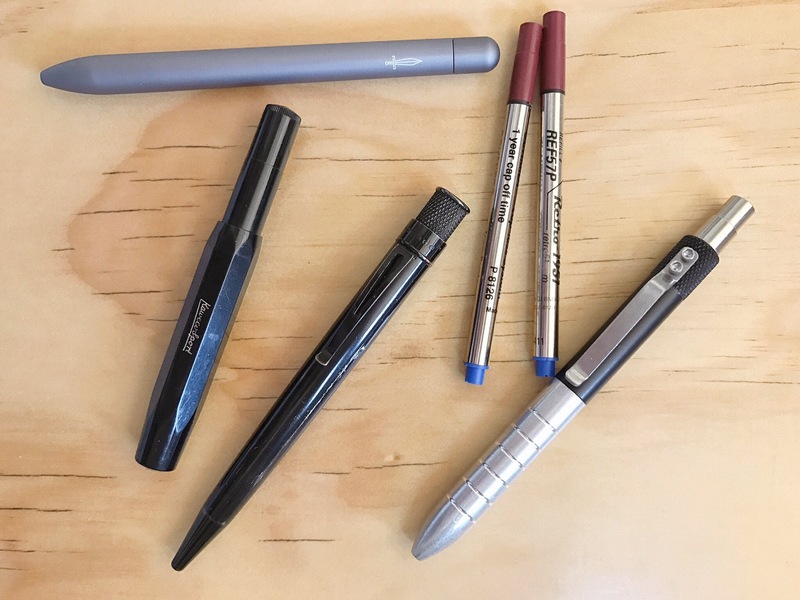 The variety of pens available should see something suitable for just about any particular preference — all the while retaining the same great writing experience between refill tip and page. Of course there are other great rollerball or gel based refills around, and I’m not suggesting the Retro 51/Schmidt’s are the be-all and end-all in this category, however are a standard and favourite for me, seeing some form of use pretty much every day. With the newly arrived Nova Minimal pen, I now have five options — perhaps a ready-made Monday to Friday rotation! More likely though is that I will simply continue what I’ve done for some time — use one for a while, and switch when the desire to do so hits me. One thing remains a certainty — although the housing may differ, the smooth, rich, and vibrant writing experience certainly won’t. You bring up a point that’s often missed: your writing style and the paper make a big difference. Another Pilot G2-sized refill famous for its smoothness is the Uni Jetstream (also hybrid ink). I’ve been using a disposable one I picked up at a trade show for a while, and I’m favorably impressed. The Schmidt EasyFlow 9000 is also some kind of a hybrid ink; I like it better than a typical ballpoint refill, but I don’t think I’d rate it higher than a good roller ball refill. I do like the Schmidt roller ball refills. My favorite rollerball refill, the pricey Mont Blanc, won’t fit because it has a metal body. I’ve chopped off a bit to fit it into my favorite big box store pen, the Pilot G2 Limited. The MB is smooth, but it has just the right amount of tactile feedback for me. On the down side, it seems to dry out quickly (unlike Schmidt capless). My preference is gels 1st (0.4 – 0.5 mm), then roller balls and hybrid inks; ball points are way behind. I also strongly prefer retractable pens over capped. I’ve had frequent issues with roller balls feathering more than I like (OK, maybe it’s cheap paper at work). I still have a Parker Vector back from my high school days; sometime I need to get a refill for it. The Uni Eye isn’t available in the US; I happen to have one because my wife brought one back from China a few years ago – I’d say it’s OK, but not memorable. Here, the most famous disposable roller balls are the Pilot Precise V5 and V7, and then Uni’s Vision / Vision Elite (Uni’s BLX black infused colors are pretty cool). Anyway, enough rambling – thanks for the post and enjoy your weekend! Thanks for the detailed comment — much appreciated. A couple of points stand out — fiddling with refills, and the concept of “too smooth”. Contrary to the nature of the post above, I’m currently taking a few notes with a Faber Castell Ambition fountain pen (medium nib), in a Clairefontaine 90gsm notebook. Great paper, however far too smooth for me, and the nib is skating around like writing on glass. That said, most hybrids or ballpoint refills I may find a little on the smooth side are mostly tamed by the paper I usually use. I’ve not actually ever tried the Montblanc. I’m certainly not averse to chopping and playing around with the refills either, and have tried a few others in the Retro 51. Interestingly, the Nova pen I’ve just received from the Kickstarter campaign has an adjustable spacer in the end of the barrel, to accommodate either the Parker style refill of the slightly longer Euro style refills. It’s interesting, and at times frustrating, the variation which exists between availability of certain models country to country. I haven’t perused the disposable rollerball options at my local Officeworks for some time. Writing the post and reading your comment has piqued my interest though — and clearly I need a replacement notebook in any event! Thanks again for the comment — they are always appreciated, and apologies for the delayed reply. I’d just add that even though they’re pricey (~6USD), I highly recommend trying the MB roller ball refills; it just seems to me that they get it right…. Despite what Namisu says, there’s a good chance if you chop off a bit that the MB will fit in your Nova pen with the shorter spacer. If that doesn’t work, you can always get a Pilot G2 Limited or similar. Will do – thanks Tony!